DD5LP/P – April 6th 2019 – DL/AL-179 Weichberg – UK/EU – VK/JA/ZL S2S event. Following the tests on the previous Thursday (report on this website) all equipment was already decided upon and loaded in the car Friday evening ready for an early start on Saturday. The trip down to Weichberg was again uneventful. Although the weather forecast was for a warm morning with sunshine, I decided to stick with my winter jacket and I’m glad I did as on arrival at the parking spot the car thermometer showed -1°C and even after 4 hours, with the car parked in the sunshine, it had only risen to +4°C. And… it’s foggy again as it was on Thursday. No time to complain as no one knows exactly when the band will open (or not), so it’s grab all the gear from the back of the car and head up the track to the summit, while at least it’s not raining! The set-up is exactly the same as on Thursday – the tripod, 10m mast and 40/20m VP2E with the X108G on the picnic bench. Actually based on what I saw on Thursday, I brought an additional item. A bright yellow plastic shopping bag which I clipped with a peg onto the antenna wire as it went over the main pathway on the summit. While putting the antenna up, I found the metal guy peg that I had lost on Thursday! Based on actions over the last few weeks I thought it would be best to start on 40m, then watch the MUF and when it rose over 14MHz switch to 20m. 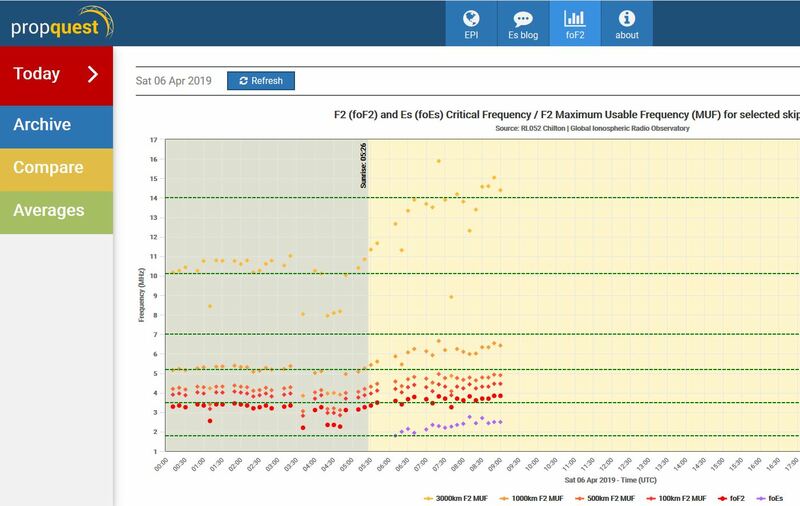 Usually the maximum usable frequency (MUF) shoot up after dawn but of late that hasn’t been happening, so it’s a question whether the MUF gets over 14MHz before the long path window closes. I started at 0540 UTC (0740 local) found a free frequency on what was already a busy 40m band, spotted myself and then started calling CQ, only to have EC4AHH start calling on top of me. I announced the frequency was in use and I’m sure he heard me but he just kept continuing to call CQ. This DQRM action, just because he has more power is a bad trait in some operators. I was hoping some QRO SOTA Chaser might come along and move EC4AHH away from the frequency but it wasn’t to be, so I had to find another frequency rather than waste more of my time with this situation. On the new frequency, I got five calls (four of those S2S), before I was DQRMed again, this time from a Russian speaking station. 40 metres in Europe is becoming a real rat race! Luckily at this point I saw via my smart-phone that the 3000 km MUF was rising nicely, in the direction of 14MHz, so I lowered the mast, opened the links and then up went the antenna again, now resonant on 20m. Tuning around the band was quiet but not for long, soon there were more and more stations on the band including a VK net booming in at 5-9+ – I tried a call but breaking into a local net in Australia with just 20 watts and a wire antenna from the other side of the world is a lot to ask and indeed it proved impossible. I looked around for a free frequency then spotted myself and called CQ. The first call came from Marat RA9WJV/P on R9U/SO-235 in Asiatic Russia! Following Marat, Juergen DK3SJ on holiday in SV8 (Greece) called and after breaking the contact, the conditions peaked and on a second attempt the QSO was completed. After that 20m quietened down again and only semi-local contacts were possible. 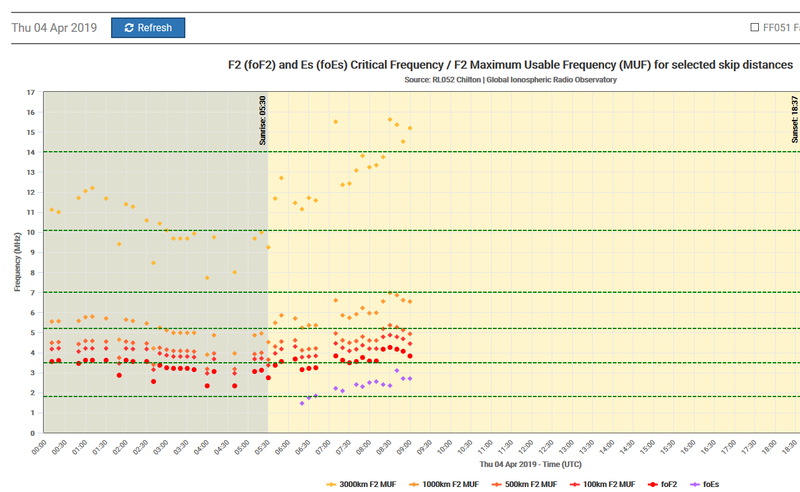 Checking on the Internet – the 3000 km MUF had dropped below 14MHz again. At 0751 UTC (0951 local). I decided to call it a day and pack up and head home. Looking at this had I stayed another 20-30 minutes, the MUF rose up over 14MHz again but by that time it is likely the long path window will have closed. So at the moment it looks like the time that contacts between Europe and Australasia are only 10 or perhaps 20 minutes long whereas those on 40m might be up to an hour-long. The problem for me is that for me to get via long path from southern Germany signals are weaker here than in northern Europe, possibly due to another “hop” for the signals being needed. Also chaser stations from Australia tend to have a beam on 20m but only a wire antenna on 40m. A comparison from this activation – a VK station on 40 metres was just copyable and probably not workable, whereas those on 20m were 5-9+. A lesson learnt – for me to get a contact into VK with the current propagation conditions I need to concentrate on 20m and be on at just the right time. A difficult combination of requirements when operating from a summit. Linked (20m/40m) VP2E (Vertically polarised, 2 element, 20m wire antenna). Antenna warning marker (bright yellow plastic shopping bag). Smartphone PocketRxTx App and USB cable with new EMI stopper board. This activation was not as successful as on Thursday with no contacts into VK. The extra stations on 40m didn’t help however even if there were less DQRMers on the band I think the signals would not have been strong enough to work in any case. Equipment-wise I have a feeling that the 40m sections of the VP2E are resonant on the bottom of 40m but not at the top of the band, so some testing will be needed and most likely the 40m section of the antenna reduced in length, probably by wrapping the wire back on itself. This needs doing before my next activation using the antenna. Perhaps it can be done at the same time as measuring the directivity of the antenna? DD5LP/P – April 4th 2019 – DL/AL-179 Weichberg – Trial run for S2S event. April 6th. 2019 will be the next Summit to Summit activity event between UK/EU and VK/ZL/JA and given the variable propagation conditions at the moment I decided to do a “dry run” to see when the bands open and which bands open, so that I know when to be at the summit on Saturday. Although I have already activated Weichberg this year and hence will not get any points for either this activation or the one on Saturday, it is relatively close to home and has an area large enough to put the VP2E antenna up. The same equipment will be taken to the same summit, so this (Thursday) activation, should reflect what is going to be possible on Saturday – at least to an extent. The equipment was prepared and packed into the car the night before as an early start was planned. The trip down to Weichberg was uneventful, I have done it so many times before. The last few days had been warm spring days but not this day and luckily I took my think winter jacket but even with that on over the time I was on the summit, I got very cold. After parking and walking up to the summit with all the gear, what greeted me at 0500 UTC was a cold, damp fog actually with ice-cold water droplets in it. Visibility was limited, so no long distance nice views today. Luckily the predicted high winds only arrived as I was leaving. The last time I had activated this summit it had between 2 and 3 metres of snow on it, at least that is gone but the fact that it is gone means the summit no longer curves as it did and I could only just fit the 40m/20m VP2E antenna into the summit area. I had planned to raise the ends of the elements using hiking sticks however this was not necessary as I raised one end by the rope going over a tree branch and the other end had its rope tied off to the top of a signpost. This site does have the luxury of a picnic bench and seating banks, which is where I set up the station once the antenna on the 10m mast, supported by my surveyors tripod was all set-up. Prior to the activation Mike 2E0YYY (or 2W0YYY/P in this case) had said he would also be out the same time as I so that we could compare notes on propagation afterwards. I had also lined up some stations in VK to listen for both of us. Based on actions over the last few weeks we both thought 40m would be the best option for UK/EU-ANZ contacts this morning and indeed from around 06:35 Mike started making contacts into VK & ZL. His first VK contact was Ernie VK3DET whom I could also hear albeit a little week at around 06:35-37 UTC. I could understand every word after a while. Unfortunately when I tried calling Ernie on 40m I wasn’t able to put enough signal back in his direction to get a two-way contact. I left Mike working VK/ZL stations and once I found a free frequency (the band was sooo full and that on a Thursday morning – which doesn’t bode well for Saturday) I worked quite a few stations around Europe before 0720, when I took the antenna down and switched it to 20m to give it a try. To start with there was nothing on the band and my CQs brought no replies. I then decided to take a tune around and after a while (at around 0735) I came across VK2MIX who was booming in, of course he had plenty of EU QRO stations calling him and I couldn’t get through the pile-up. I went back to my chosen frequency and put out more CQs again with no response, so I tuned around and found VK3TJK, Tim, even stronger than VK2MIX (I made a recording of how strong and clear his signal was – even less chance getting through this pile-up though). I went back to my frequency again and this time I got a call from Michael DJ5AV which overloaded my headset but then I heard something and put out a call for VK/ZL only and to my amazement, there was Ernie VK3DET at 5-5 and he gave me a 3-3 report. To make the day even better Ernie’s call was followed by a call from John VK6NU again 5-5 with me but I was only 3-1 with QSB back to John. The two contacts were made though! After a few more CQ calls with no answers, I tuned around and could no longer find either VK3TSK or VK2MIX, so, as I was freezing cold (the weather had gone from Spring to mid-winter overnight!) I decided to pack up. If I had waited another 20 minutes or so, it looks like the MUF came back over 14MHz again, so further contacts may have been possible but as the winds were increasing and it was approaching 11am local time when I needed to leave in any case, I decided to pack up and call it a day. My conclusions time-wise (and this is only from my southern Germany location, the UK will be different). for Saturday, are from 0630-0700 to try 40m Long Path and then as soon as the MUF goes over 14MHz switch to 20m as the signals on 20m were far stronger than on 40m with me. I get the feeling that 40m long path contacts are easier to make from the UK than from southern central Europe and the added gain by the use of beams by chasers on 20m makes all the difference in making a EU-VK contact. I’d say this was a successful activation in that I know now when the band is opening on the long path on 40m & 20m and why the 20m opening was delayed (MUF). I tried out the filter unit in the USB connection lead and it appeared to work fine (considering it has had some bad reviews, I’d better order a couple of spares before giving it a good review). My set-up with a USB adapter rather than a cable made is rather short, but the required USB cable has been ordered and should be here in a couple of days, so soon I should be able to put the problem away. Strangely today, I could actually read the display on the rig itself most of the time as it was such a grey morning. I could hear one VK on 40m (weak), two on 20m booming in but with pile-ups and worked two pre-arranged VK chasers who were 5-5 with me and I got a 3-3 from one and a 3-1 from the other! VK3DET & VK6NU. My mechanical modification to my wooden plate to use it as a base for the bottom of the mast worked first time as well! I lost one of my metal guy pegs this morning on the summit. I put it in my pocket but it fell out somewhere – I looked and looked but couldn’t find it. I’ll take another look on Saturday. DD5LP/P – February 5th. 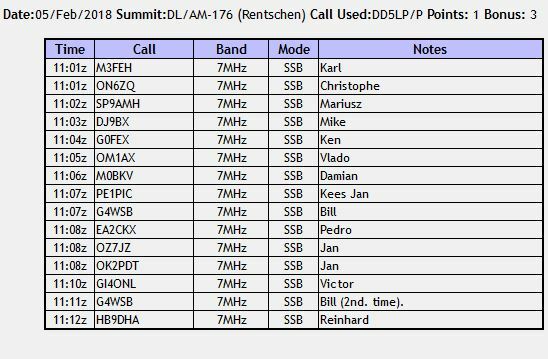 2018 5 summits in a day DL/AL-169 & 179, DL/AM-001,176 & 177. As it’s now a new year and we still have the winter bonus of three extra points to the activator in force, I decided to put together the well tried and tested gear and head off to five local, easy access summits. Originally I had though of including a sixth – DL/AM-178 Ammerleite however since the easy access road has been made private, there is a long walk of about 2 kilometres from another road and the last part of that route is not on a prepared track, rather across a field up to the summit cross. this last part can be problemsome. I have been up to my knees in snow on this last part of the ascent and even if the snow has cleared the ground will almost certainly be very muddy. Not a good candidate for a “quick” activation. Equipment would be the “tried and tested” Yaesu FT-817ND plus modified Ramsey HF amplifier, the SotaBeams band-hopper linked dipole and my 6 metre fishing pole plus this time a screw-in Sun umbrella base. Auerberg is accessed from the church and restaurant’s car park and then a walk of about 50 metres up the side of the church (quite a steep climb but not long). Around the back of the church this is a bench seat to sit on and fence posts to attach the antenna mast to. Weichberg is accessed from a forest car park and then walking up through the forest about 150 metres to the Chapel with table and bench seats outside. Rentschen is a drive up summit formed by a plateau. Once there I walk across to the trig-point stone and set up. No bench at this one, take something to sit on. Kirnberg has no car park so I drive to the farmers gate and then walk up alongside his fence to the cross (this farmer is really cool, he towed me out when I got bogged once – typical country guy). There’s a bench at the cross here as well. (Hoehen-)Peissenberg is the easiest of all, you drive to the car park and then walk up the concrete steps and path to the other side of the church and set up on the bench there. My plan was to activate DL/AL-169 Auerberg, DL/AL-179 Weichberg, DL/AM-176 Rentschen, DL/AM-177 Kirnberg and DL/AM-001 Peissenberg in that order. The order seemed reasonable however as I later found out, it would have made more sense to reverse the first two as the route from DL/AL-179 to DL/AM-176 took me back through the village underneath DL/AL-169. Oh well, next time I should know better. In the same way the route from Auerberg to Weichberg could be along main roads but leaving my GPS Navi to do the route planning it took me along single track country roads, in at least two places these went THROUGH farm yards on their route! Oh the fun of GPS-Navis! The weather at home although cold there was no snow to be seen. Surprise, surprise all summits were still snow covered from snow that came down a couple of weeks ago! Temperatures varied from -9C on Auerberg “up” to -4.5C on the last summit Peissenberg. I was glad of taking my thick winter jacket but despite that, the way I felt when I arrived home, I believe I suffered some Hypothermia. Apart from the realisation that I should have done the first two summits in the opposite order, the drives to the summits were uneventful. Auerberg (my first summit) has a surprise for me when I arrived apart from the horribly cold temperature (-9°C) access to the summit had been closed as renovation work on the church building that sits on the actual summit has started and everything was fenced off. At this summit, even down to the car park is part of the Activation Zone so I set up on the short track up to the church. Of course now I had no bench seat, so I put out my painters sheet which kept sliding down the slope on top of the hard packed but also frosty snow. This was not starting off the day well! After spotting and calling for some time I did manage to get 5 contacts despite at one point, my smart phone being so cold that it stopped working actually “froze up” and then rebooted. This was cold. So as soon as I didn’t hear any more calls I packed everything up and headed back to the warmth of the car. Even folding the painters sheet was difficult in the cold and several items simply got pushed untidily into the rucksack. After a scenic run along single lane country roads, I got to Weichberg. While there was still the bench seats and table here, a small tree that I used to strap the antenna mast to was no longer there and I had to use a fence post some distance further away. The end result was that the coax from the antenna was not long enough, so I had to put the station on the painters sheet on the ground again. That new antenna location can’t be very good as I had difficulty getting contacts just managing the minimum four required before packing up. Even though the temperature had now risen to -6°C the small rubber reels that I wind the antenna leads onto was really stiff and that combined with the, mandatory in these temperatures, gloves meant winding up the antenna took longer than normal. Everything takes longer than planned in such cold temperatures. To add to the fun, the antenna wire broke when I was taking it down and so got a quick repair so that it could be used on the next summit. It was while driving to Rentschen, I realised that I was driving back past Auerberg and could have activated the two Algaeu summits in the reverse order. Apart from that the drive was uneventful. On arriving at Rentschen I decided to park just half off the road to avoid getting bogged, took the usual two packs plus my sun umbrella screw-in base as I knew at this location, there is no where to strap the mast to. I set up about half way between the road and the trig point stone (the whole plateau here is in the activation zone). By now the temperature had risen to -5°C and a lot more chasers were active. I managed 15 contacts on this summit in 12 minutes and then started the pack-up again. 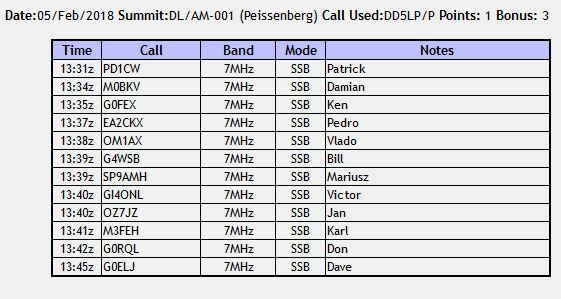 While I could have tried 20 metres for more contacts, I was already running late on my planned schedule, so I only operated 40m SSB on each summit. The next summit about 30 minutes drive away was Kirnberg and I here I left the car parked on the road (I learnt my lesson getting bogged once before here). The wind had increased and the temperature had fallen one degree down to -6 again. Once I walked up to the summit cross and put the gear on the bench seat, I again used the screw-in base to support the mast. I have strapped it in the past to the fence posts but it has often tilted over a lot, so while I had the base with me, I decided to use that. This summit brought me eight contacts in five minutes before I packed everything up again and headed back down to the car. Just one more summit to go. The drive over to Peissenberg was probably the longest and went past the point where I would have turned off to do Ammerleite but the overall direction was heading towards my home now. I grabbed a little lunch (I had brought a pack-up with me) before setting up at my normal spot on the bench overlooking the valley from the side of the church. This time 15 minutes brought 12 contacts and an interested visitor who I talked to for five minutes. Now that I had enough contacts on 40m, any thoughts of perhaps activating 20m were curtailed by the fact that my Smart Phone (which had been running 4G comms for watching and spotting all day and Bluetooth for hands-free while in the car) had 100% drained its battery. Without being able to self spot, no one would know that I was on 20m looking for contacts. So it was definitely time to pack up and while packing away one of the link connectors in the antenna broke away from the wire – another thing to fix at home (along with the broken wire, which was now wound together and taped). Peissenberg was a “warm” -4.5°C by the time I left for the well used by me, country back roads route to my home. Modified Ramsey QAMP amplifier (30-35W on 40m). I was surprised by the fact that there was still snow on these low summits (at home it had melted 10 days earlier) and especially the wind that I found made the low temperatures even worse. It took longer than normal to get anything done. I am glad I didn’t try for the sixth summit, it could have ended with me being very ill by the end of the day. Do not under-estimate the effect of cold on the human body. I decided to stay with the same equipment on each summit. Had I used my Aerial-51 OCF dipole instead of the SOTABeams band hopper, I could have switched to 20m without having to take the aerial down but it probably was wise to stay just on 40 metres when I had limited time available for each summit.